Naming has always been a critical element of branding. Whether it’s a global brand or a school newspaper, the power of a name can evoke many emotions; therefore it’s critically important to spend time curating a name that represents your company correctly. Historically, once a name was chosen the route to naming was fairly simple. A quick corporation or trademark search would essentially comprise most of the clearance legwork to move your name forward. Once you had clearance then maybe you tried to get a matching toll-free number, but that was about it. Today, however, the complexities of naming are only growing in scale and finding the right name involves so much more than a trademark search. Not only should you obtain legal clearances but you need to check on the competition in search results and whether or not your preferred domain name and social handles are available. If they are available, you then need to search for brand confusion from global companies and more. Finding a name is the easy part now—securing the digital assets has become the higher challenge. There have been many articles published about the value of a good domain name. Many companies understand this value and are quite proud when they are finally able to acquire their .com (such as Discord App, which acquired the domain name discord.com last week and posted about it on Twitter), while others simply do not understand it at all. 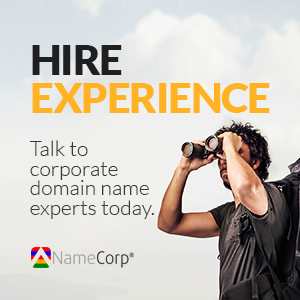 However, it’s not just domain names and social handles anymore. One of the newest naming solutions is happening now in the crypto currency space. In fact, the numbers are mind-boggling for something still so new. When investing in crypto currency you need to understand what a digital wallet is and how blockchain works. Hundreds of thousands of users have created digital Ethereum wallets using solutions like MyEtherwallet.com and Mist, and it’s highly unlikely few can remember their own wallet name. With this ID you can send and receive many digital currency forms, and if you know somebody else’s wallet ID, you can look it up on sites like etherscan.io. For example, if you want to look up the balance of the wallet above (a wallet we created for this article), simply visit etherscan.io and punch in the wallet ID. And a page will appear detailing the transaction history associated with this particular wallet. Sounds a lot like the Domain Name System, right? Well, just like IP addresses, which work wonderfully for computers speaking to one another, the odds of people remembering addresses such as 0x06C426A3D6889a8D3326c2d4eB6c9BF899DcCa8F are about the same as you winning the lottery—impossible at best. Much like domain names, ENS has an option for users to choose a custom handle. So, instead of 0x06C426A3D6889a8D3326c2d4eB6c9BF899DcCa8F, you could identity your wallet as tickets.eth, for example. However, securing a custom handle is not as easy (or affordable) as you may think. In fact, it’s pretty fascinating because many of these .eth wallet names are selling for tens of thousands of dollars already. 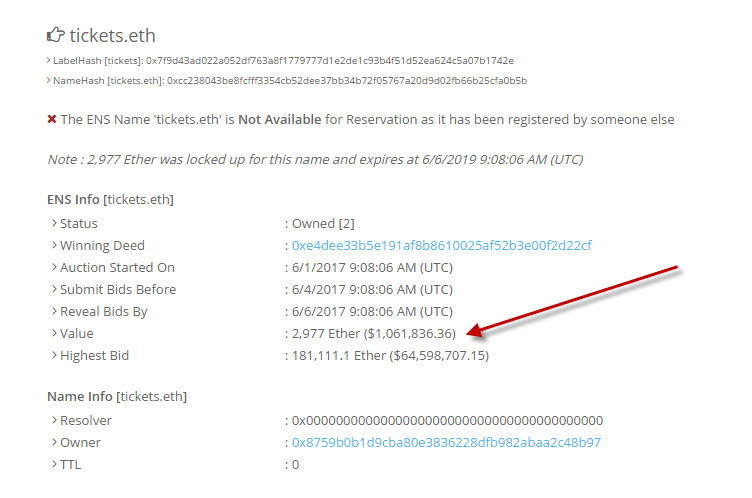 For example, tickets.eth sold for 2,977 ETHER. That converts to… wait for it … $1,049,154.34. It’s a fascinating read, actually. Just like social handles and domain names, these vanity Ethereum wallet names are becoming highly popular and are still in the early days of naming – they were only launched less than 45 days ago on May 4th. In fact, they have character limitations, auctions, the ability to create subdomains, and more. The system is even built with future dispute resolutions in mind and auctions are based on the Vickrey auction model – where bids are sealed and the highest bidder wins but only pays the bid of the second-highest bidder. Sound familiar for those involved in new gTLD applicant auctions? If you are interested in naming as much as we are, and want to to learn more about currency wallet naming, here are some links to help understand the market. 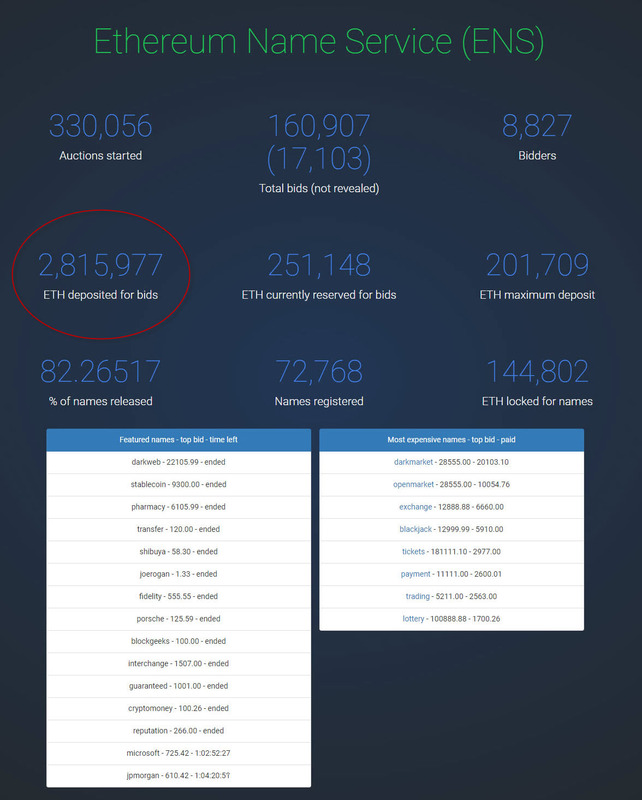 According to Codetract.io, more than 2.8 million Ethereum tokens (over $100,000,000) have already been deposited for bids. Basically, it’s already bigger than you or I probably ever imagined. Digital naming. The fun never ends.